I had a hard time trying to figure out what to do with this page. I eventually figured out how the story was going to end and used this page as a bit of a set-up for that. 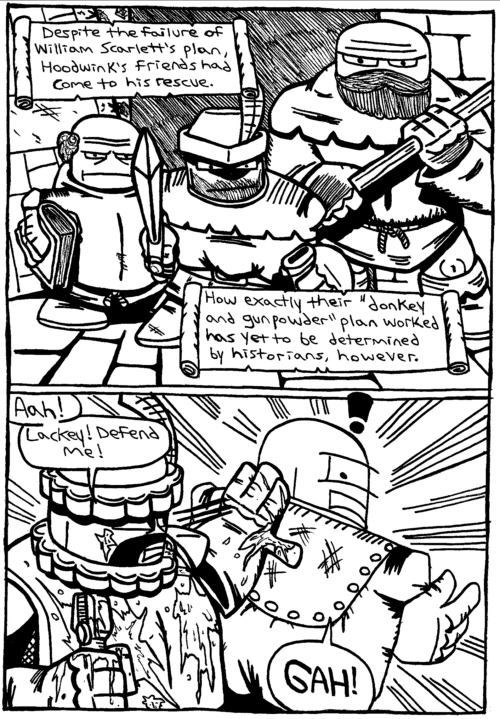 I also incorporated a bit of the commentary from the last strip into the narration (the bit about the donkey and the powder keg). Free Comic Book Day is tomorrow! I’ll be at Happy Harbor Comics Volume 2 tomorrow along with Daniel Schneider doing sketches for folks in exchange for donations to the Food Bank. There’ll be burgers, hotdogs, costumes, and free comics! And at some point Ed the Sock and Liana K. of Ed and Red’s Night Party are stopping by! In my last news post I talked about Grand Theft Auto IV a bit, and since then I’ve taken the online play for a spin. The combat controls work substantially better in multiplayer than I expected them to. After playing online I’m starting to understand where the 10/10 ratings are coming from. So far I’ve only been playing in Team Deathmatch, but it’s a good time. Basically you get the teams set up then you’re dumped into Liberty City and unleashed on each other with the goal of collecting as much cash as possible by committing as much violence as possible. It reminds me of the old Quake multiplayer combined with the freedom of GTA, since there are guns, armour, and health packs lying around all over the place for you to snag. Cars aren’t as powerful as vehicles are in some games, since it’s not especially difficult to hit the passengers through the windows (especially if the game host left auto-aim on). The moment that really sealed how much fun the multiplayer: I picked up a Desert Eagle for the first time and then jogged off into the street looking for somebody to use it on, at which point a guy came zooming at me in a car. I saw him on the radar coming up behind me so I turned around and unloaded a shot, which popped the guy in the head through the windshield and killed him just as his car splattered me all over the pavement. If you’re going to trade kills with somebody, THAT is a great way to do it. I also noticed that not many people use cover in multiplayer, which I find kind of strange. I’ve found that whenever I’ve ducked into cover I’ve managed to get multiple kills in a row even when outnumbered and just using a pistol. Replace the pistol with an AK-47 and things get ugly. Maybe it’s just the people I’ve been in games with prefer to run-and-gun, or like the black and white death sequence or something. It’s very tough to take out people in cover (you pretty much have to headshot them), so it’s a little weird that not that many people are using it. That’s enough rambling from me. Thanks for reading, have a good weekend and check out Free Comic Book Day! This entry was posted on Friday, May 2nd, 2008 at 8:46 pm and is filed under Rent-A-Thug. You can follow any responses to this entry through the RSS 2.0 feed. You can leave a response, or trackback from your own site.